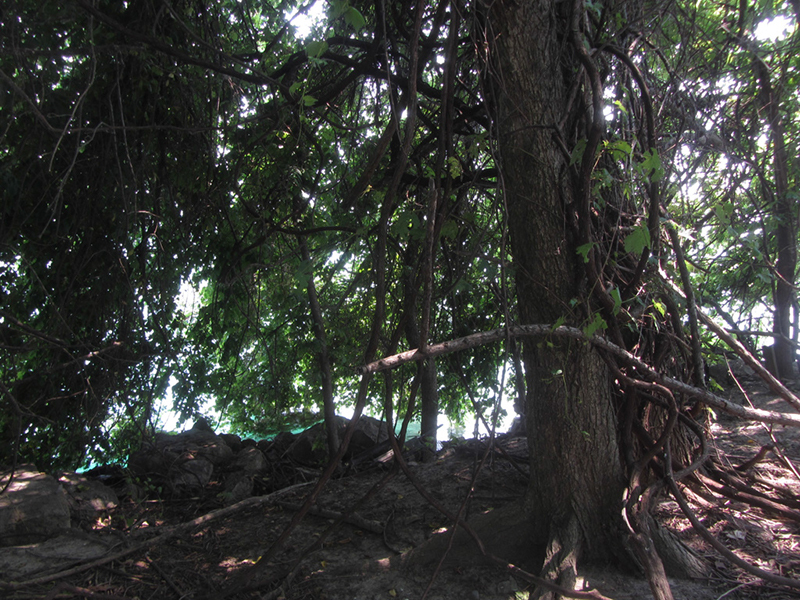 On my boat trips up and down the Detroit River to explore Stony Island, Sugar Island, and other places, I have stopped at many smaller islands of lesser note that are nonetheless notable for their natural beauty and serenity, so I will exhibit a couple of them in this post. Celeron Island (see on map) is the southernmost island of any size in the Detroit River before you start to get into Lake Erie. It is uninhabited, and as far as I can tell always has been--which is a bit of a rarity. It is actually two islands, connected by a marsh in between. 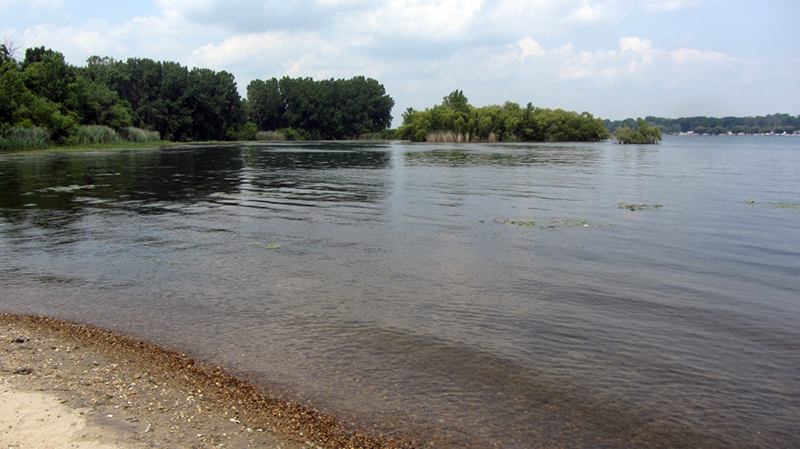 I was attracted to checking out Celeron Island not just because it was one of the few that you can actually go to without being in some rich person's front yard, but because it was one of the very few that sported any kind of sandy beach. The only other island around here that I knew of with a natural sand beach was Sugar Island, and every square inch of it is always hogged up by local boaters at any conceivable time that you might think of going there. 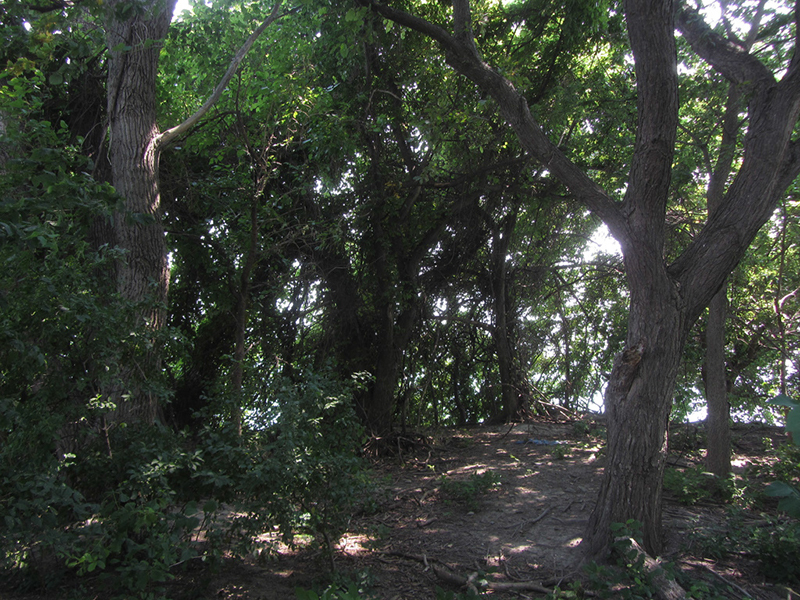 According to Detroit historian Silas Farmer, this island was named after Sieur de Celeron de Blainville, the French Commandant of Fort Detroit in the mid-1700s, but the book Michigan Place Names seems to suggest that it was also called "Tawa" Island, perhaps when it was still owned by the local tribes. 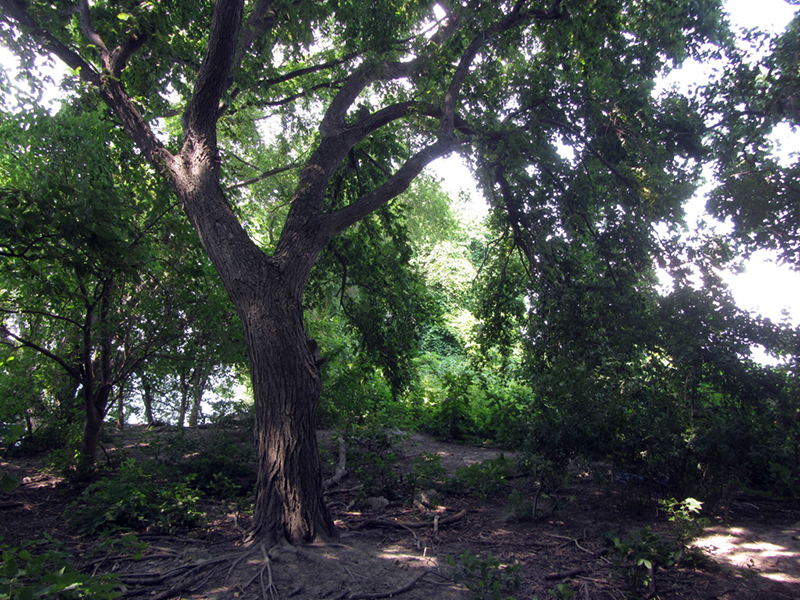 It was turned over to French settlers by Potawatomi natives in 1742, according to a Free Press article. 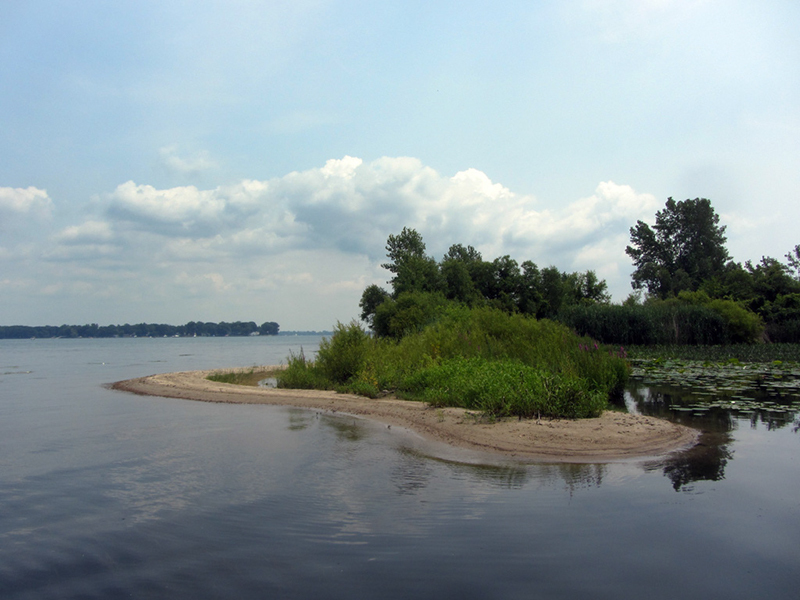 Celeron was inherited in the early 1800s by Sarah Macomb, widow of William Macomb, as well as several other islands in the vicinity that had formerly belonged to her husband, including Sugar Island, Hickory Island, Fox Island, and Calf Island. 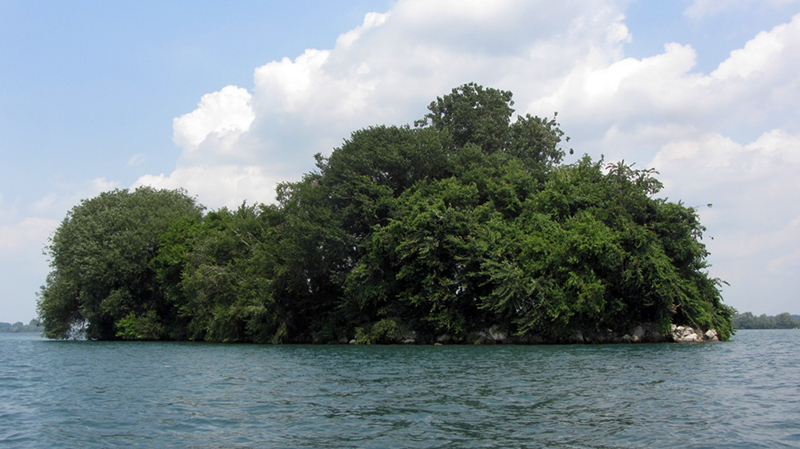 According to another 1959 article, the Potawatomi used to call Celeron Island "Pinacaga," Stony Island was "Indowaga," Calf Island was "Ashobucacy," and Hickory Island was "Matagwabiconce." 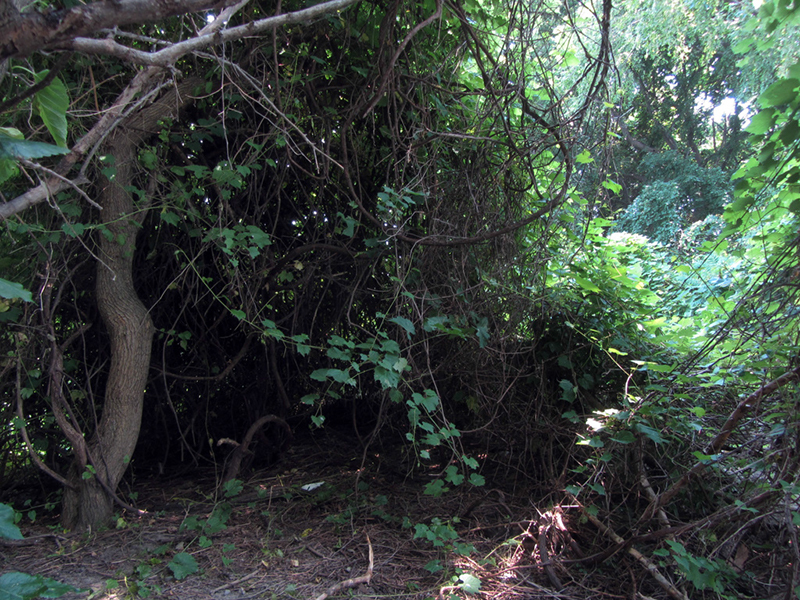 According to the historical blurb in the Free Press, the island was known in those days for its abundance of rattlesnakes, which locals would sometimes come and hunt for sport, according to author Isabella Swan. In her book The Deep Roots, she quotes from the diary of Major Joseph Delafield, an agent for the U.S. Army in the c.1820s negotiations for an end of the border disputes following the War of 1812 with British Canada. He wrote that the rattlesnake hunting on Celeron Island "an amusement in this country that strongly indicates a great dearth of reasonable objects of pastime," and describes how the snake hunters would wrap their legs in blankets to prevent being bitten. 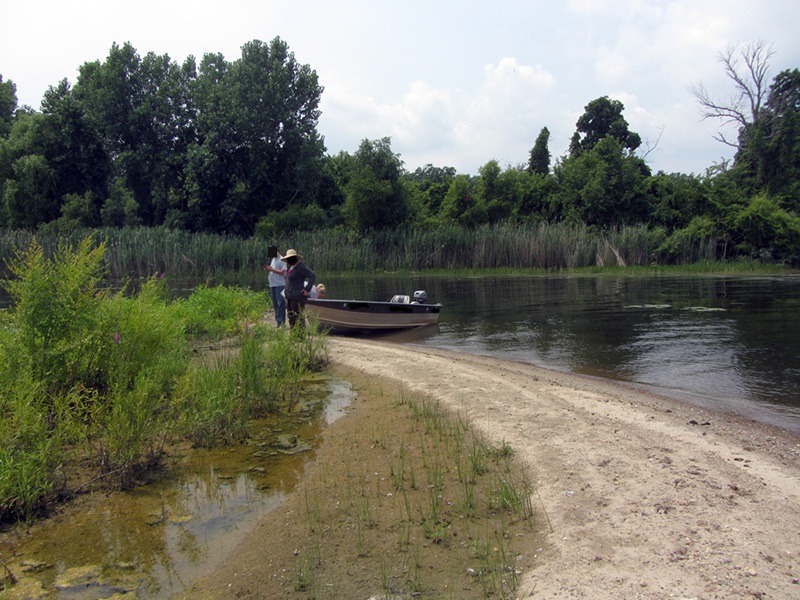 Celeron was owned in the 1970s by some "entrepreneurs" who sought to turn it into a boat club and golf course, but after a decade of battling with conservationists, they gave up and sold it to the DNR. 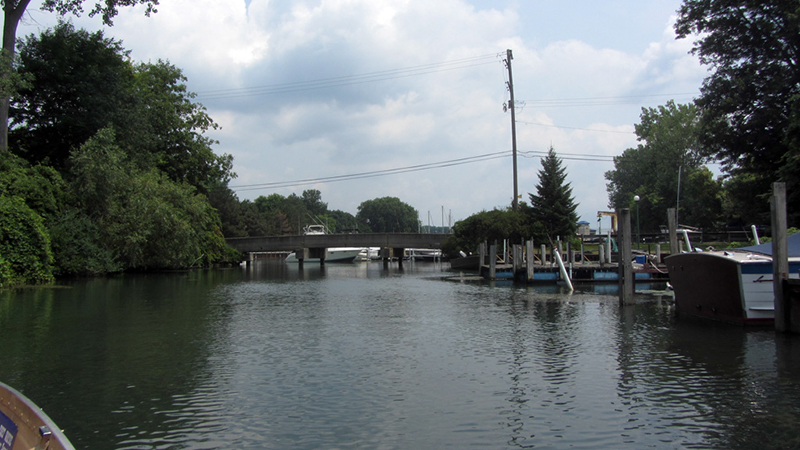 One of my readers who grew up on Swan Island tells me that Celeron Island was inhabited in the '50s and '60s, and had "summer homes, telephone poles with lines connecting the homes," and a canal dredged through the middle of the island, but the structures are "long gone" now. 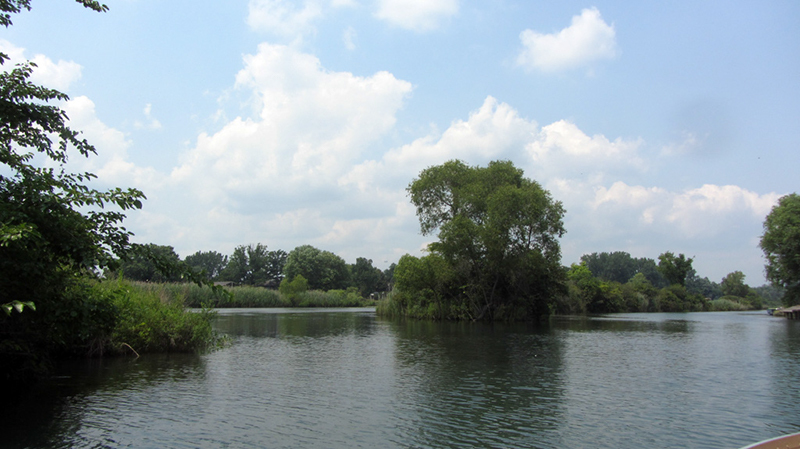 By my reckoning the marshes of Celeron are one of the most tranquil hiding places in the Detroit River. 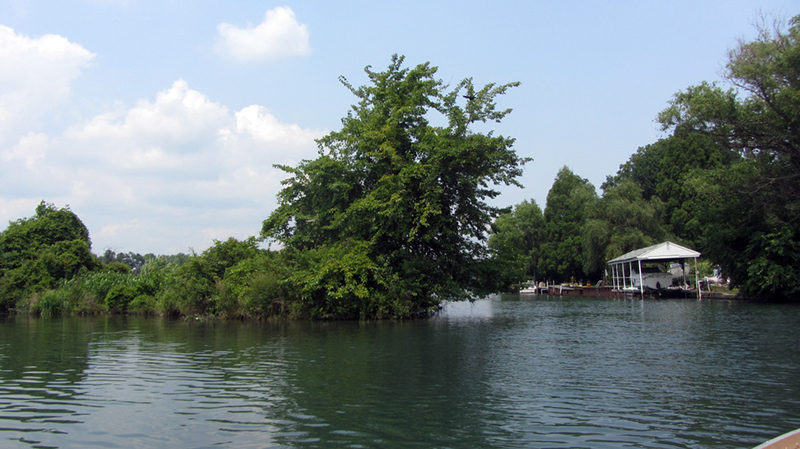 In early 2013 the Friends of the Detroit River received funding from NOAA to develop construction plans to restore the wetlands around Celeron and Stony Islands. 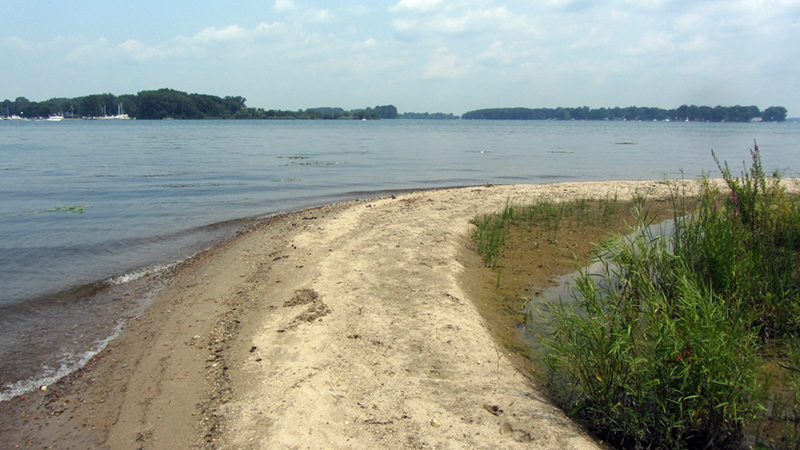 They, and other partners such as the DNR, have worked to develop plans to address these islands' erosion problems and to improve and protect their habitats. 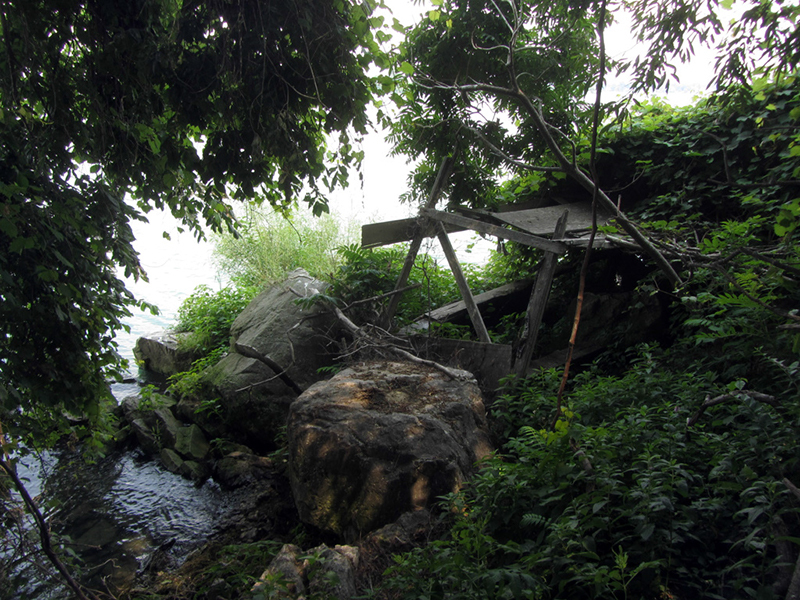 Next we went up around the back of Hickory and Meso Islands, and under the bridge there to circumnavigate Elba Island. 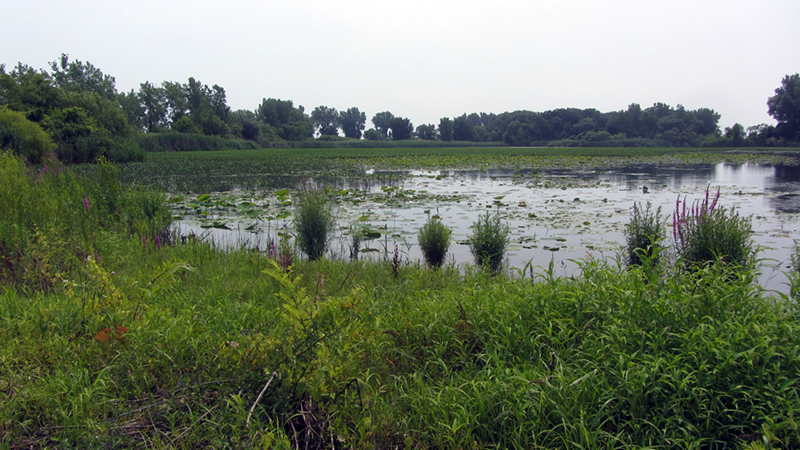 There is a big marsh between Elba Island and Grosse Ile, with a small canal that we could pass through. Ransom Eli Olds, the founder of Oldsmobile, built a summer estate here in 1916 named "Elbamar," which was designed by Albert Kahn and still stands today. According to discoverdownriver.com, many other famous Detroit industrialists also had digs in Grosse Ile Twp., such as John Kelsey, founder of Kelsey Wheel Company; Charles and William Fisher, of the Fisher Body Co.; William "Bunkie" Knudsen, president of General Motors; both Henry Ford, and his infamous bodyguard Harry Bennett; John Karmazin, Sr., inventor of the automotive radiator cap and other related patents; John Telnack, designer of the Ford Taurus; J. Robert Beyster, founder of the Science Applications International Corp.; Heinz Prechter, inventor of the automobile sunroof, and founder of the American Sunroof Company; and James Vernor, of the Vernor's Ginger Ale fame. President George Bush Sr. even served at the Grosse Ile Naval Air Station here. Perhaps the most pertinent Grosse Ile native was Cameron Waterman, who invented the outboard boat motor here in 1905. 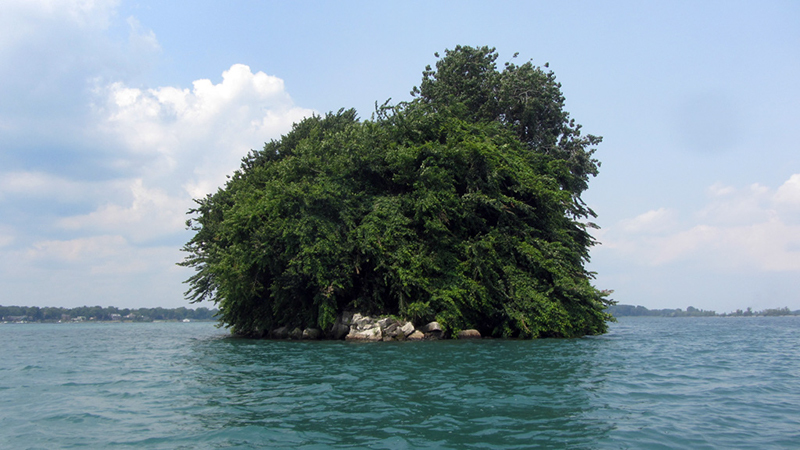 So we skipped that and continued to another small island that I've always passed up on the way to more interesting stops--the minuscule Powder House Island (map). I hadn't seen any signs of a powderhouse there on the aerial map view, but the fact that such a small island was given that name in an area that was heavily militarized on and off throughout the 1700s and 1800s tantalized my imagination. 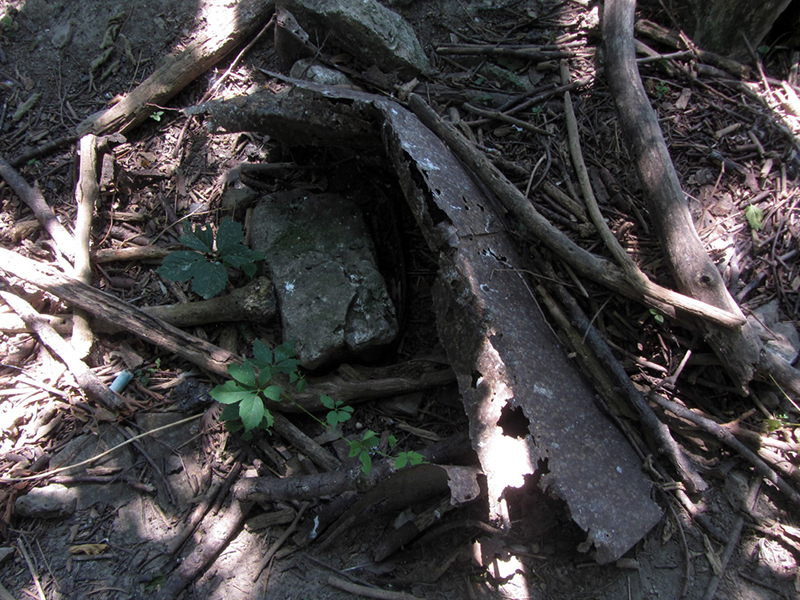 Clearly I needed to go there to investigate in person, to see if I could find any traces of a magazine or blockhouse. Usually such powderhouses are built extremely sturdily, for obvious reasons, and as such the ruins of one ought to stand well the test of time, making for the exciting possibility that I might find something very cool if I went there. 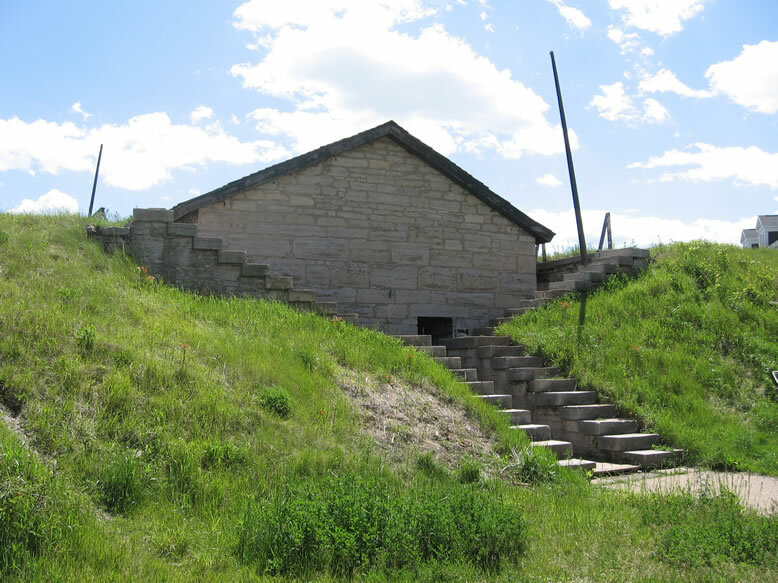 There might have once been a long forgotten ammunition cache kept on the island during either the Patriot War in the 1830s, or the War of 1812, or something like that. 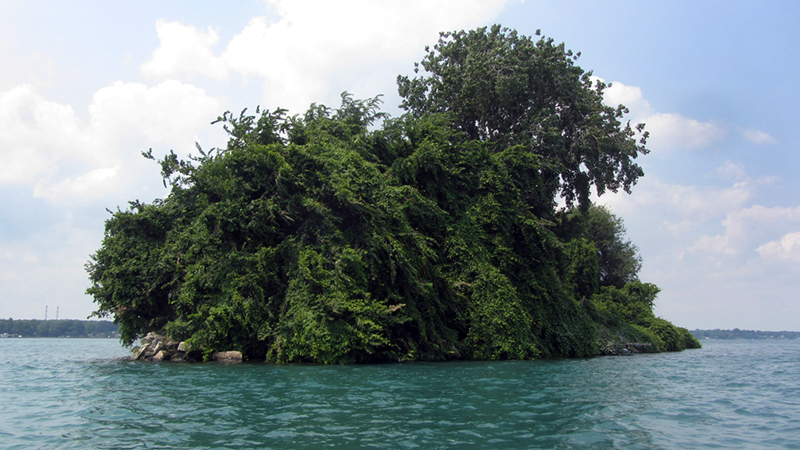 According to Silas Farmer, Grosse Ile was once seriously considered by the French to be the location of Fort Detroit, before Detroit was founded, which further tempted me to think of this tiny islet as having a one-time military stash. Not to mention the fact that the British Fort Malden was built on the Canadian shore in 1795, less than a mile from where we were now. 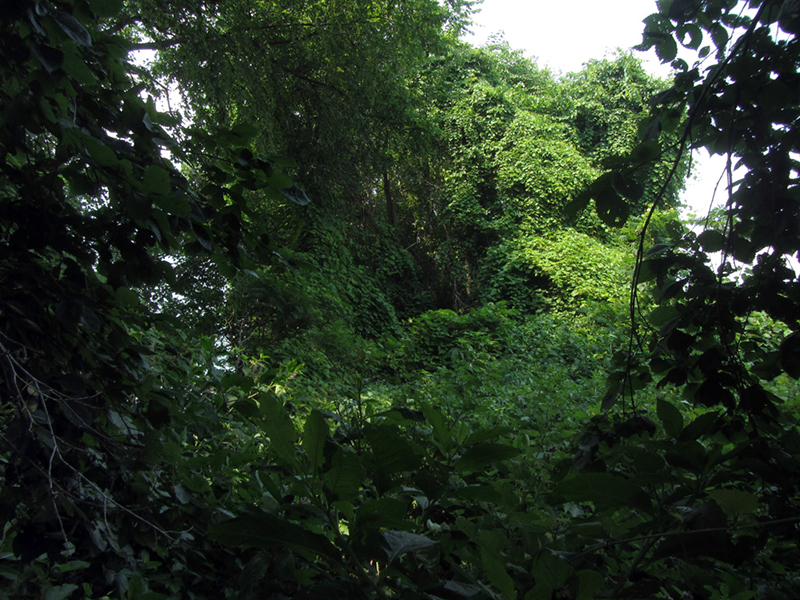 I circled this deeply veiled rock, looking for an opportune place to land. The moment of truth...was this the part where we were going to be barraged by poison darts, or swarmed by vampiric zombie spider monkeys? My first mate cautiously brought us in and tied the mooring line up to a tree. The Dunbar & Sullivan Dredging Co. were based at Stony Island, and stored their dynamite on Powder House Island (also known as Dynamite Island) when they were excavating the Livingstone Channel, according to a c.1908 court case, Henderson v. Sullivan. I'm not sure when the name-change from "Dynamite" to "Powder House" occurred however, or even when Dunbar & Sullivan began operations in Detroit for that matter, but a USGS document says that the first dredging here occurred in 1874. 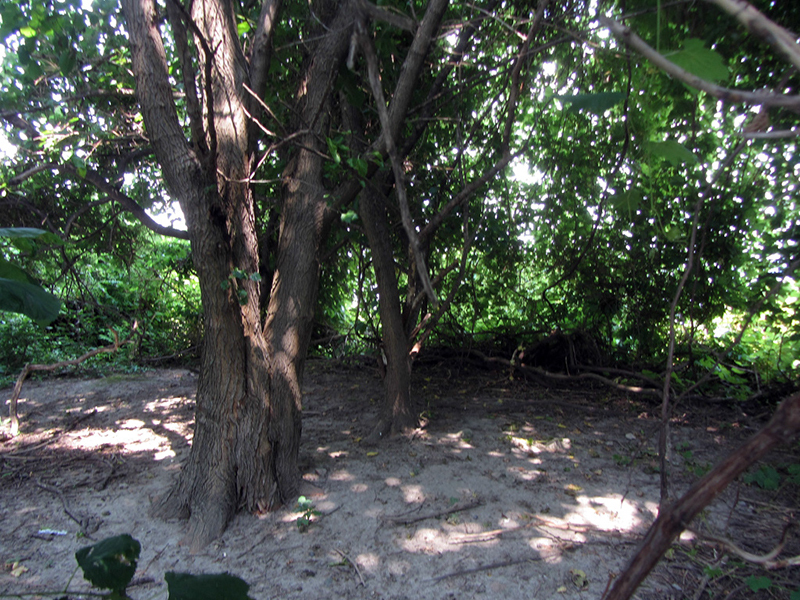 There was also an old abandoned limestone quarry on Stone Quarry Island (which has since become joined to the south end of Grosse Ile); they would also have had need of storing dynamite, and may have been storing it here on Powder House Island as well. 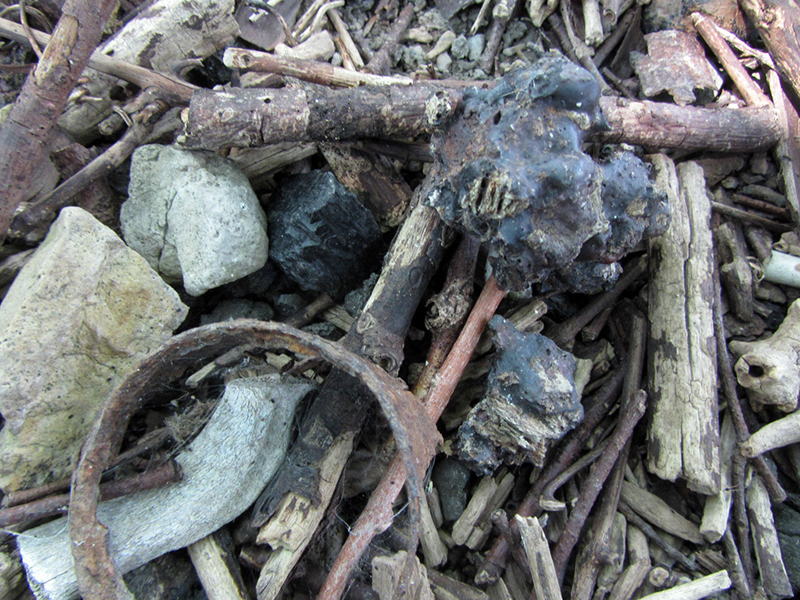 There was a lot of debris to be found here, but no signs of any past structures. Ultima Thule, Pt. 3: “The Bill Nichols Trail & the Quest of King Phillip"
Reading through the court document, Dunbar & Sullivan originally stored their dynamite on the aforementioned Fox Island (the one we passed up because the beach was full), but there was an explosion there in 1879, so they chose this island as the new storage location. Another explosion occurred on Powder House Island in 1907 or so, which is what resulted in the Circuit Court of Appeals case brought against Dunbar & Sullivan by a pissed-off property owner on Grosse Ile whose windows were blown out. 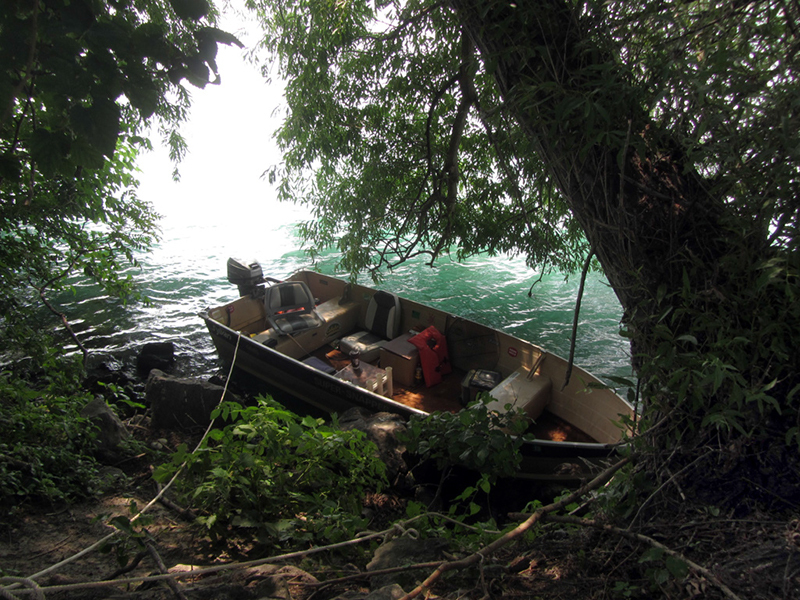 Two boys who were fishing nearby were also injured, and their boat was destroyed by the blast. The lawsuit was to prevent Dunbar & Sullivan from storing any more dynamite on the island, though it sounds like they may have been allowed to continue doing so if certain improvements were made. 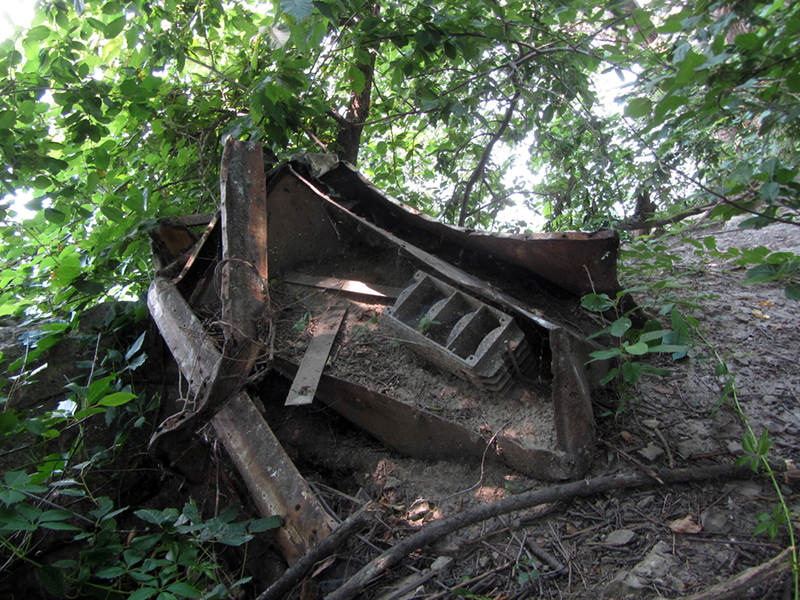 A similar accidental explosion occurred at the storage shed of the Sibley Quarry in Trenton, in 1900. Another personal account quoted in the Free Press claims that the explosives stockpile on Dynamite Island was once again accidentally detonated in the 1950s or so by the stray bullet of a hunter who "misfired." 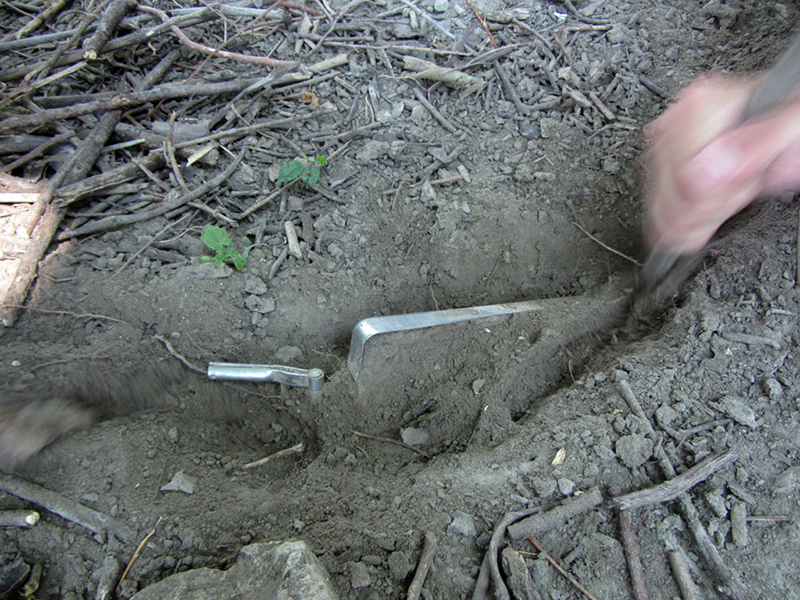 Two of my crewmates found the edge of something else buried in the soil, that by their estimation was worth digging up to see what it was. They quickly gave up on it however when it proved to be some modern mundane object of uncertain use. That is, unless, this stuff was all part of a random load of mixed refuse that was dumped here from a passing ship at some point, which would not be out of the question. The spike was hand-forged, so it was definitely made before 1920, possibly as long ago as the 1700s or early 1800s, according to one source. 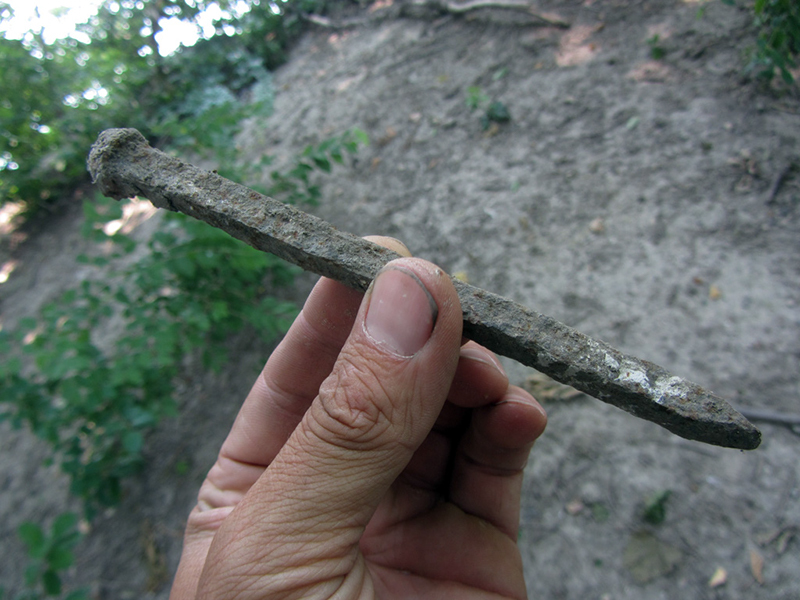 Judging by another source, my spike could also be what was called a "cut nail," which would mean it was an early type of manufactured nail, made between 1800 and 1900. 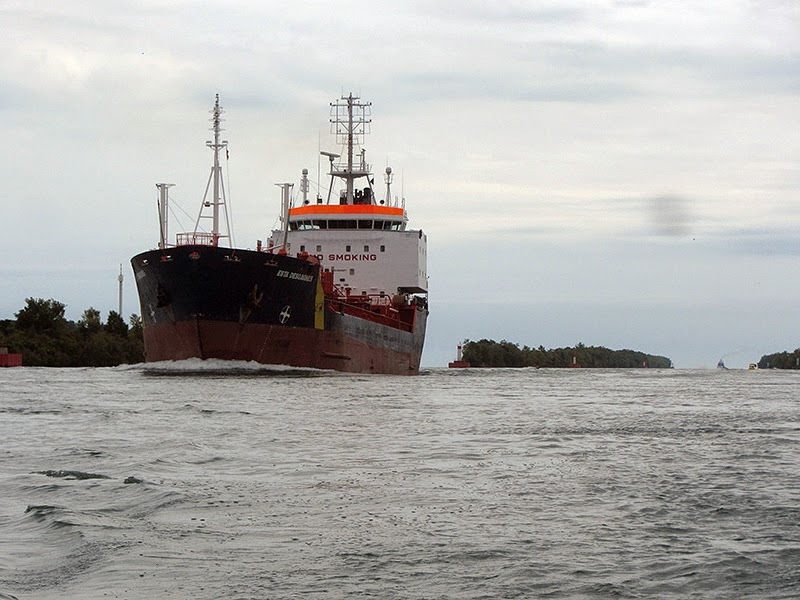 But I wonder if the remoteness of operating in the islands of the lower Detroit River mandated that Dunbar & Sullivan fabricate certain hardware when needed even as late as the early 20th century, as opposed to sending out for supplies and waiting for delivery to their remote locale? Looking closer at the record of Henderson v. Sullivan, I now see that it says Dunbar & Sullivan anchored a scow (barge) over "what is now Powder House Island," and stored their explosives on it. The island apparently didn't exist yet at that time, and was subsequently built up later by sinking the barge and dumping dredge material onto its wreck until it became an island, at which time "some shanties were built" on top of it for the storing of dynamite, in June, 1906. The shanties were "insubstantial structures," and "one witness said you could throw a cat through the cracks" in their sides. Oh well, so much for my hopes of there being a long forgotten pre-American magazine on this island. 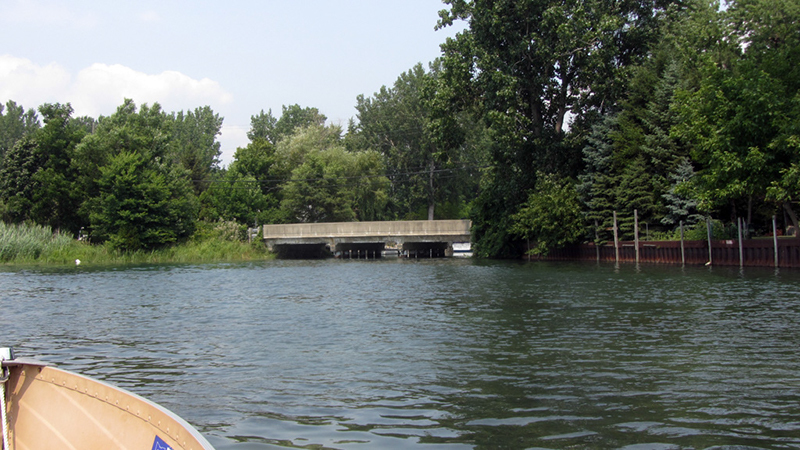 I lived on Swan Island from 1947 until 1967 and remember that Celeron Island was inhabited and had summer homes, telephone poles with lines connecting the homes. 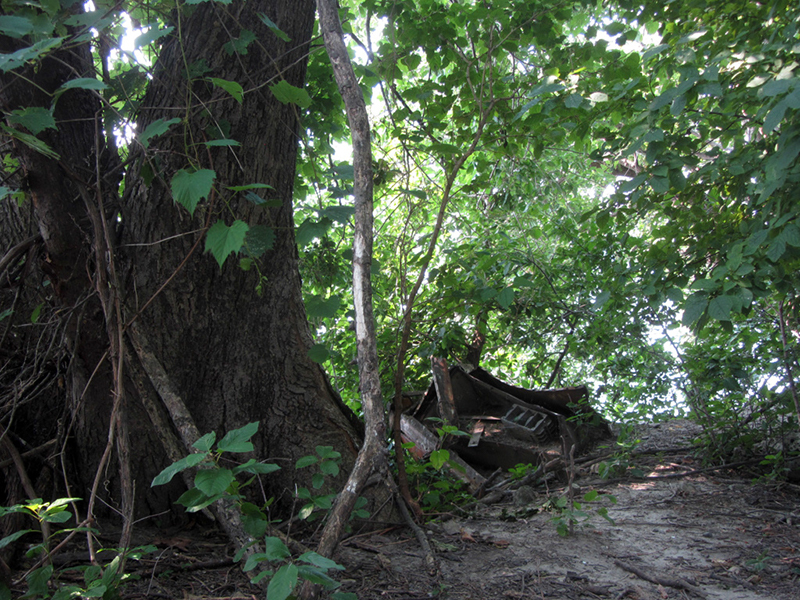 It was bought by an individual in the late 50's or early 60's and he had a canal dredged that split the island in two. As a side note, my parents Steve and Sylvia Kish met on Sugar Island in the long gone dance pavilion in the late 30's. Now all the uninhabited islands are off-limits to us who use to explore them in our youth. 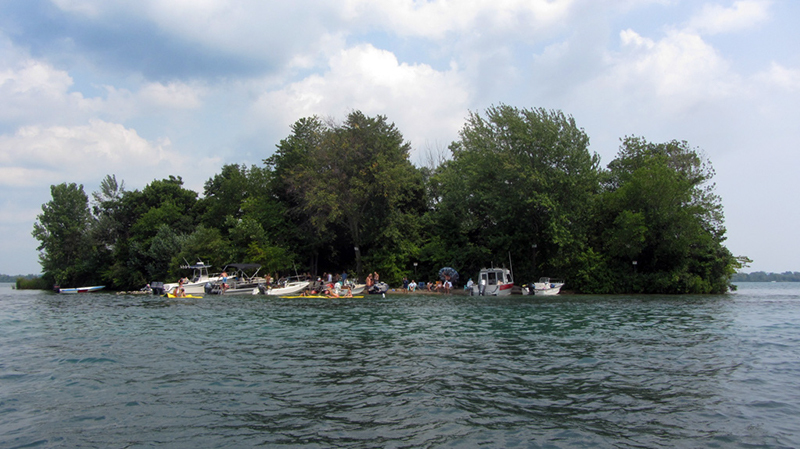 The homes on Celeron have long been gone and our Detroit river is no longer ours, but is now owned by the government. It seems to me that government today forgot who their bosses are, US! Maybe time to fire the professional, life-long politicians and replace them with people who actually work everyday and make an honest living.